MINI ONE active Microclimate Generator for Museum Showcases. 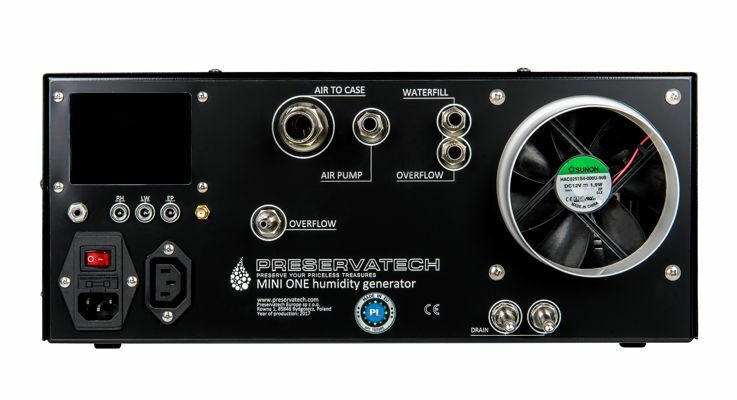 The Preservatech Mini One is a miniature humidity control device for museum showcases and storage enclosures. This robust and extremely efficient unit can reliably control humidity in individual or multiple enclosures. The Mini One active microclimate generator is a sixth generation system, satisfying the demanding standards of preventive conservation and modern museum design. It incorporates the most recent developments in electronic humidity control, noise suppression, and pollution abatement — built on the heritage of a family of microclimate control devices extending back to 1978. 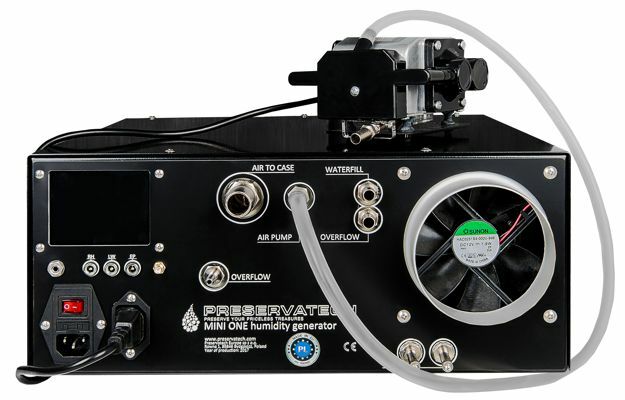 This positive pressure microclimate control system will typically maintain the relative humidity level in a sealed museum enclosure to within two percent (or less) of your target relative humidity. Depending upon the ambient temperature conditions and enclosure construction, relative humidity levels of less than thirty-five to over eighty percent can be attained. Ambient gallery air is filtered for pollutants and drawn into the microclimate generator. 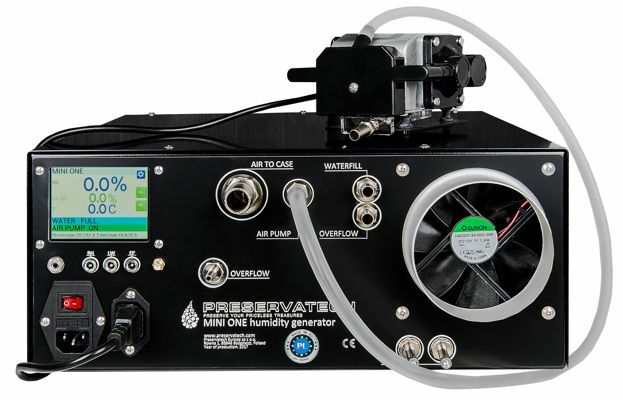 This air is pressurized and directed through a proprietary mechanism that adjusts the relative humidity to the preset value. 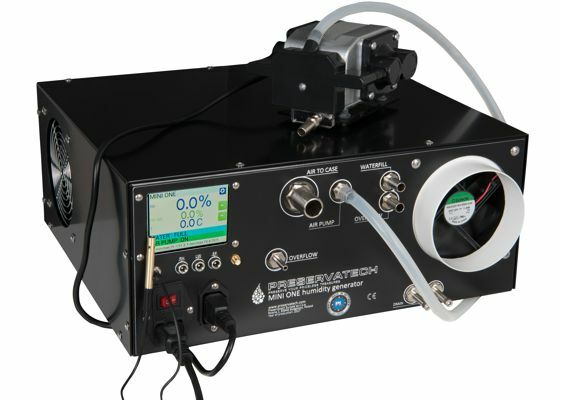 This air is directed through a small flexible tube to an input port in the showcase. Air flow to the enclosure is constant, and in normal operation, the air is delivered only at the set RH level. 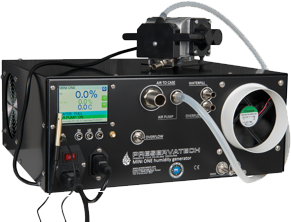 The Mini One humidity generator can be operated in a variety of modes, depending on enclosure characteristics and acceptable control limits. 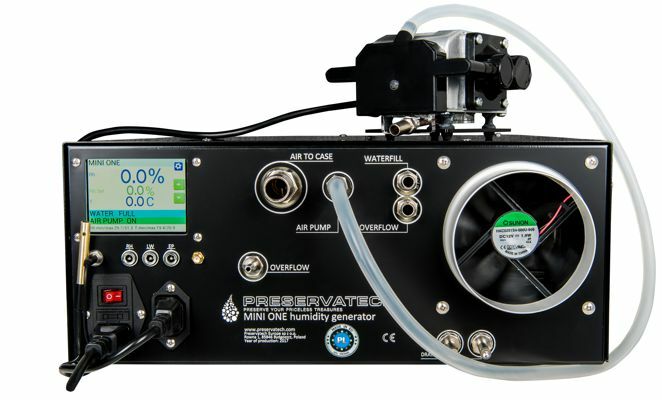 Output from one microclimate unit may be distributed to more than one case, or multiple microclimate units may be used on a single case when more capacity is needed. The microclimate unit may be placed immediately beneath or next to the showcase, or at some distance away. In normal applications, the microclimate unit provides humidity control for a single tightly sealed enclosure, usually not exceeding two cubic meters. 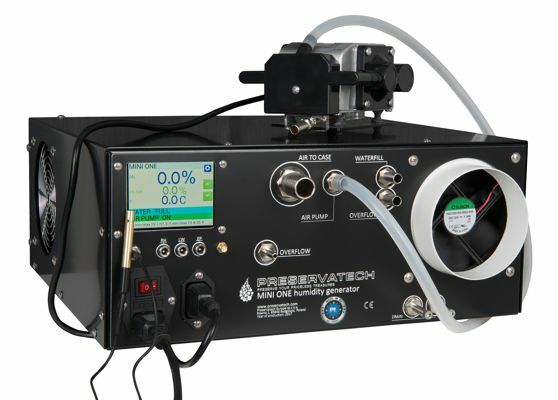 In these applications the unit will typically provide extremely accurate humidity control; the unit does not add or subtract moisture from the air — it gently feeds a steady stream of air into the showcase at the target humidity, displacing existing air and pollutants in the enclosure, which is forced out through gaskets and existing leaks. Each machine is equipped with build in data logger. RH data are written on SD card which can be read in Preservatech software or any other program able to read csf files. 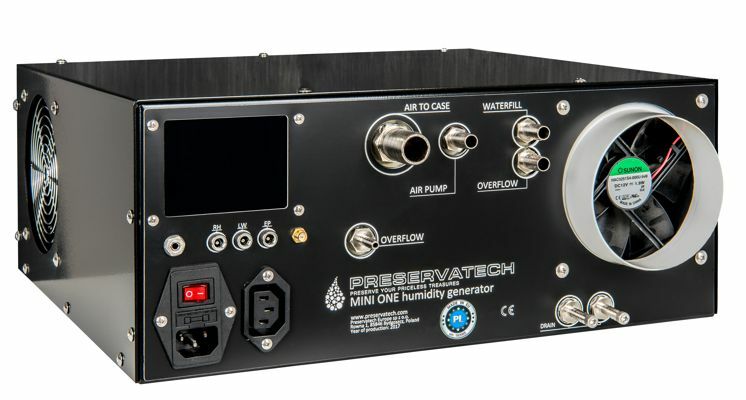 As all of Preservatech’s equipment, Mini One active microclimate generator can be connected to the monitoring service. Bypass Valve: Automatic, typically triggered at +/- 3% from target (adjustable). For newest version of manual and brochure, please see DOWNLOAD page.